The junction at the bottom of Middle Meadow Walk, Edinburgh’s flagship route through Edinburgh’s flagship park, has recently had a bit of a facelift. Considering that the council themselves described this work as “relatively minor”, the improvements delivered are in some respects substantial. Nevertheless, the council has missed an opportunity to deliver a really significant improvement by pacifying the last 30mph crossing which poses a barrier to safe pedestrian and cycling journeys through the park. This is doubly unfortunate as last year saw the closure of nearby Meadow Place – a grim rat run – with a cheap set of bollards, providing pedestrians and cyclists with a huge increase in safety at almost no cost (notably, no increase in congestion has been measured). The failure to protect the crossing is particularly regrettable as the junction is so close to the Sick Kids hospital and on a route busy with school children. (I wrote recently about the sadly predictable lack of a temporary crossing when the works were put in place – and although doubtless just an unhappy coincidence, at least one ambulence was called for a child while the works were underway). 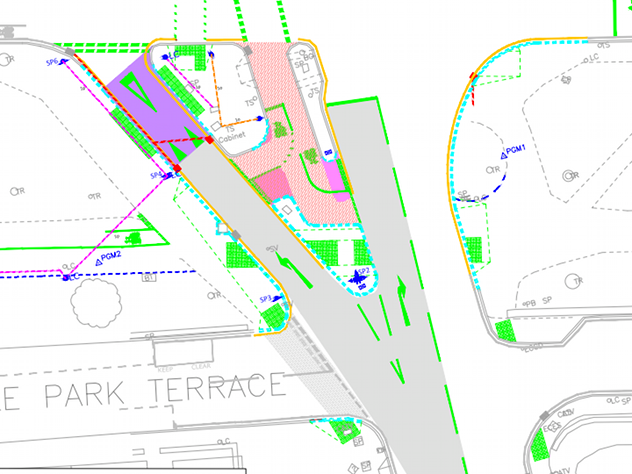 Dominant traffic flow is along Melville Drive and the crossing from Argyle Place to Middle Meadow Walk (the main opposing flow) is protected by lights, phased to allow traffic from Argyle Place to turn right onto Melville Drive at the same time – right of image above. 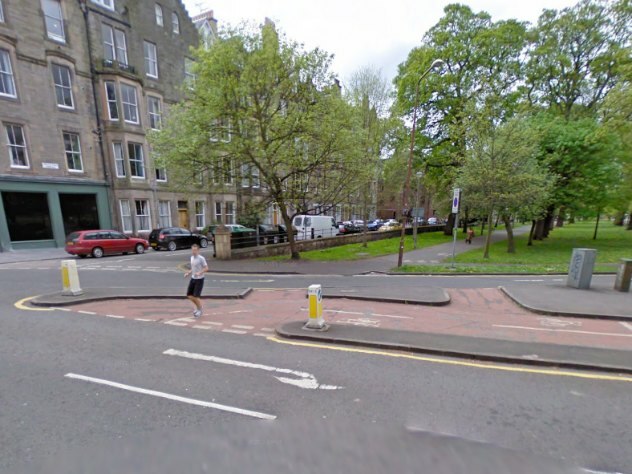 At left, you can see the contentious high-speed slip road that allows vehicles turning left from Argyle Place to bomb past multiple crossing points. 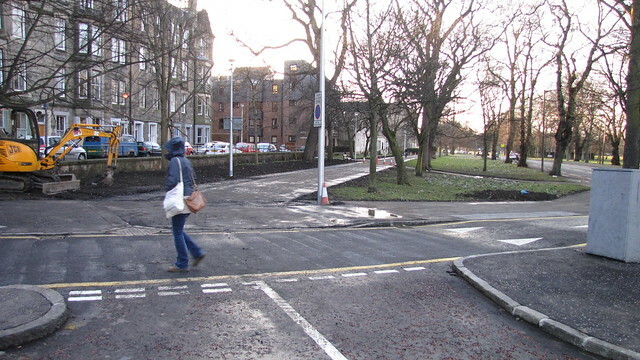 Traffic turning left from Argyle Place enjoys a dedicated slip road which is not light controlled – either to protect pedestrians/cyclists crossing from South Meadow Walk or in the interests of westbound traffic on Melville Drive. This is the crux of the problem with both old and new designs. 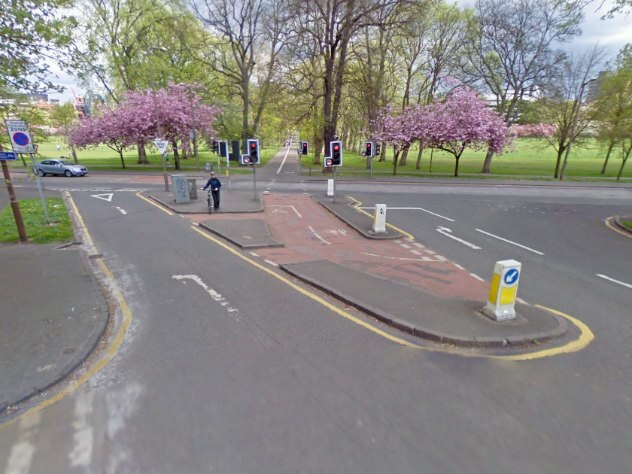 The junction has always been considered a bit of a joke, and was routinely circumvented, with many cyclists riding directly onto Argyle Place despite the green-signalled oncoming traffic, or cutting across pedestrians directly onto Melville Drive to avoid it. Unfortunately the revamp only slightly addresses long-standing safety concerns around the unsignalled left filter lane onto Middle Meadow Walk. If you want to get onto the island from South Meadow Walk on this side you still just have to cross the unsignalled traffic flow. However, it leaves the obvious question – out of the two pedestrian crossings and one cycle crossing on the slip road, why is the speed table not extended to cover all three (or at least both the pedestrian crossings, leaving cyclists to ride over at ground level)? It seems a significant investment has been made fitting drop kerbs and tactile paving to the South Meadow Walk pedestrian crossing when it could hardly have added significant cost to use the existing kerb line and pour a second tarmac table, thus moderating vehicle speeds on the approach. The prominent “speed up to 30mph” signage right before the unsignalled crossings doesn’t exactly send out the best message either. Video monitoring has taken place during the peak morning period (7:30am – 8:45am) to help understand patterns of use. With fewer than one car per minute using the slip lane during rush hour, everyone is asking the obvious question: why wasn’t something more fundamental done about the slip to get around the whole problem of vehicles bombing down to Melville Drive across three pedestrian/cycle crossings? 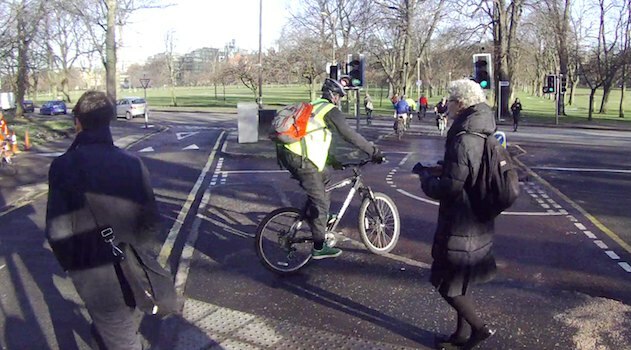 This video still shows six cyclists, five pedestrians and no cars using the Argyle Place junction. Given that motor vehicles make up just 1/6th of junction movements, why doesn’t the slip road have to give way at the cycle path, instead of vice-versa? Too expensive? Why are a tiny proportion of motor vehicle movements being prioritised over pedestrian and cyclist safety? The existing light phase for Argyle Place (which controls traffic turning right onto Melville Drive) could easily have been extended to cover the slip road for traffic turning left. No timing changes would be required as the number of vehicles is small – just 68 private vehicles between 7:30 and 8:45am on a weekday, less than one per minute. The average period between green lights for Argyle Place was also monitored for the final 30 minutes of that period, and is 23.8 seconds (never more than 28 seconds), meaning that on average in rush hour there would be fewer than one extra car queueing at the lights if they were extended to cover the slip road. Consideration was also given to removal of the left-turn lane from Argyle Place onto Melville Drive, however this would have resulted in the need to reduce the crossing time for pedestrians and cyclists. As such, a decision was taken to retain the left-turn facility to ensure maximum crossing time for pedestrians and cyclists to/from Middle Meadow Walk. Hmm. We’ve seen that fewer than one vehicle per minute (just over one vehicle per minute, including commercial vehicles) uses the slip road at peak time. Even if the Argyle Place light phase had to be slightly longer (very doubtful, as fewer than one extra vehicle on average would be queuing there), is it credible that would significantly impact through traffic on Melville Drive anyway? Regular readers will know that I like to turn my hand to random things, in this case hacking the council’s “Argyll Place at Melville Drive : General Arrangement” documentation. There are text links below this image over which you can hover to view alternative plans including a second crossing table, and one including an extended light phase. (Incidentally, my consulting rates are very reasonable). If any real traffic planners read this, I hope you appreciate that I figured out how to wire up the new light in the third image. Admittedly traffic management is a game anyone can play and a profession for fewer. 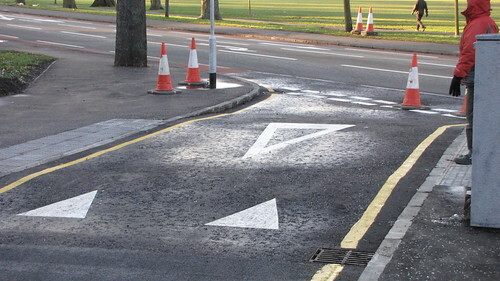 But this really does leave a lot of people asking whether the cost of digging in a single new traffic light and painting a white line across the slip road, or building a second table instead of installing drop kerbs, could really have been so great? What guidance was given when the replacement design was commissioned? Ironically, rush hour looks to be one of the safest times to use the new junction, because traffic on Melville Drive is so heavy that cars can only exit the slip road when the pedestrian crossing phase goes on. In turn this allows pedestrians to cross from South Meadow Walk to the island without worrying about moving vehicles. All-in-all this is a step in the right direction, but it’s unfortunate to see the leadership that was provided over nearby Meadow Place (by the previous administration) has not been continued. If this was a school report, it would be “must try harder”. The fundamental problem in Edinburgh is that the powers that be are still obsessed with maintaining high levels of motor traffic through the city. They might talk about pedestrian and cyclists, but they don’t like to give them priority, so active travel will always be considered to be secondary to motor traffic. The other problem here was a failure to look at the benefit a calmer street might have made to business. During the total closure of the street there was no discernable downturn in business. I wonder if some adjacent streets also saw less rat run traffic. Area is a 20mph zone and this was actually observed when street was closed. Buses of course should still have access. Closed roads also offer safer parking (perversely). Traffic is now back to accelerating down to the blind corner. On plus point the radius of turn for bikes is now better and surface much better. I agree, it’s far from the near-useless disaster of the QBC – it’s a meaningful improvement that is very welcome. In the fullness of time, we may see this as a necessary stepping stone towards really excellent junction designs.